It’s mid-July, which means summer is unfortunately already at the halfway mark. Soon enough, most of us will be heading back to college, so why not enjoy the great summer weather while it lasts? Making the most of the summer sun usually means taking a trip to the nearest beach or pool, which is a great opportunity to wear some fabulous summer essentials. You’ve found the perfect swimsuit, have some stylish sandals and a fun beach bag, but what will you wear over everything? Love simple silhouettes and clean lines? Try on a classic cover-up. 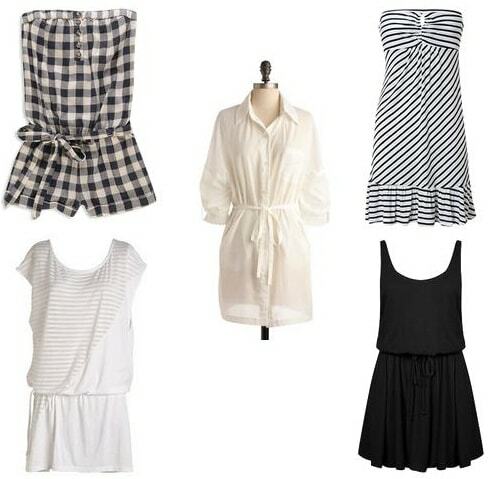 The white button-up and black cover-ups are super simple, but oh-so-chic– perfect for the beach. If you’re a girl who loves patterns, try this gingham romper or one of the striped cover-ups. Would you rather add a rocker vibe to your beachwear? These edgy pieces have you covered. Some of my choices include a bold one-shouldered dress, a studded black cover-up and a grungy graphic tunic. Are you a fan of a flowy and laid back style? If so, these boho cover-ups are for you. From pretty prints to ultra-trendy crochet, these styles will make you look like a true beach babe. I also included a tie-dye number, for all of you boho girls that lean more towards a hippie vibe. 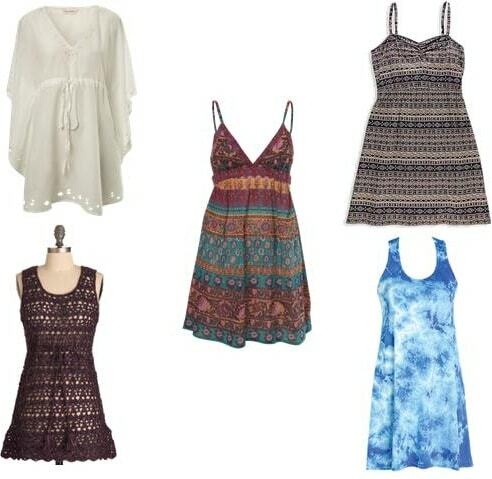 If soft, pretty frocks are more your style, I have five ultra-feminine cover-ups for you to choose from. You can go with a delicate floral cover-up or a basic white dress that’s sure to make your swimsuit pop. Personally, I love the cover-up on the top right most; it has a girly sash, cute polka-dot print and is totally functional for the beach. Are you looking for a beach cover-up? What do you think of these choices? Which category best resembles your personal style? Do you already own the perfect cover-up? Leave a comment and let me know your thoughts!